Bells Hollow Estates community is sold out and is not in active development by builder. If you are interested in Bells Hollow Estates or similar new home communities, contact us today! 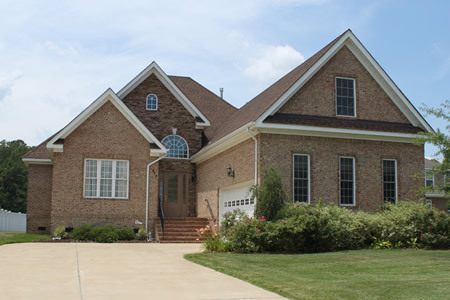 Our agents are very familiar with new and newer construction in Chesapeake, and can identify resale opportunities in Bells Hollow Estates, as well as builder inventory available in nearby or similar communities in Chesapeake. To view 11 more pictures, interactive maps and the full, detailed description of the Bells Hollow Estates community, please Login. Enjoy the beauty of Chesapeake land in Bells Hollow Estates. Houses for sale don’t always come with such an array of options in sought-after school districts; not so with this community. These homes are close to the military bases of Hampton Roads like Norfolk Naval Shipyard, the Coast Guard Finance Center and Naval Medical Center Portsmouth, yet deep enough in the pastoral countryside to bring those heart rates down. Each home includes nine-foot ceilings, exterior flood lighting, two-car garage, kitchen pantry, garbage disposal, master bathroom double sinks and more. The land on which the community sits boasts a park tucked away for residents and their guests to enjoy. Bells Hollow Estates is located in a prime location when considering a child’s education. These houses for sale are located in the highly desirable Great Bridge school district and are served by Cedar Road Elementary, Great Bridge Middle and Grassfield High. This part of Hampton Roads is close to places that make it easy to squeeze in some fun. The Intercoastal Waterway affords boaters the deep water to head out for a day at sea. Malls, shopping centers and a vast array of boutiques allow shoppers to get their fill. Fast food, fine dining and mom and pop grills are available when the crowd gets hungry. Bells Hollow Estates is the perfect full-time getaway. Take the time to come and see what this section of Virginia has to offer. Check out the schools, houses for sale, serene sunsets and see how there is always room for one more family. The land, the locals and the lifestyle are three reasons why your new home could be in Bells Hollow Estates. Send me more information about communities similar to Bells Hollow Estates. Our agents gladly offer FREE property tours of Bells Hollow Estates, Chesapeake and homebuyer consultations to all serious buyers.